Black and white party themed pin badge. This fun 25mm badge has the text, I'm only here for the beer written in a typewriter style font. 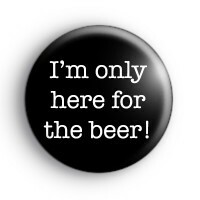 This is a fun badge to wear to any birthday party, wedding or stag night. The perfect gift to give to friends that are a bit of a beer monster and like to get drunk. We have so many funny adult themed badges in the shop so if you're looking for a few more designs make sure to take a look at those too.